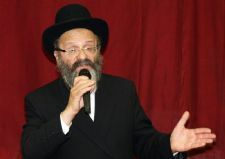 Rabbi Nachman and Freida Holtzberg – parents of Rabbi Gavriel Holtzberg who was murdered with his wife Rivka in terrorist attacks that claimed 170 in Mumbai last November – embarked on a four-day speaking tour this week in London. Speaking in synagogues, schools, private homes, businesses and to local rabbis and communal leaders, the Holtzbergs inspired those they met with a message of hope and faith in the face of tragedy while raising awareness and support for the efforts currently underway to rebuild the Chabad House in Mumbai. On Sunday evening, some 300 people gathered at Lubavitch House in Stamford Hill to hear Rabbi Holtzberg speak at a farbrengen (Chassidic gathering) in honour of the Yud Beis Tammuz - the day marking liberation from prison of the Previous Lubavitcher Rebbe, Rabbi Yosef Yitzchak Schneerson, in 1927. From the outset, Rabbi Holtzberg made it clear that he would not be delivering a hesped (eulogy) given the festive nature of the occasion. Instead, he chose to focus on stories demonstrating the outstanding achievements which his son and daughter-in-law managed to accomplish with self-sacrifice in their short lives. "The ahavat yisrael (love for one’s fellow) of Gabi and Rivki was amazing, but we should not wait until we are in Mumbai to have that ahavat yisrael," Rabbi Holtzberg told the crowd. "We can do it in London too, do not wait until tragedy strikes, but do it now, in good health and spirit." "Everyone knows what happened in Mumbai and it was therefore understandable how Rabbi Holtzberg presence at the farbrengen would bring a sense of solemnity and even sadness,” reflected Yisroel Nyman, a lawyer who attended Sunday night's event. "Nonetheless, he emphasised that this should not be a sad occasion and shared many positive and moving anecdotes from his son's life which gave us a glimpse into his inner world. He challenged us to learn from Gavriel and Rivka's example and to aspire to strive for a greater level of devotion and self-sacrifice in our own lives." The following day, Rabbi Holtzberg spoke to members of the Lubavitch women's organisation, N'shei Chabad, at Beis Chana Women's Centre in Stamford Hill. Rabbi and Mrs. Holtzberg were only scheduled to spend 48 hours in the North London Jewish community before continuing their journey to Israel. However, upon hearing about a synagogue in North West London named in honour of their son, they decided to extend their trip in order to meet its congregants. "We knew they were flying off quickly after speaking in Stamford Hill, but we were adament that we had to meet Rabbi and Mrs Holtzberg to speak with them about our synagogue,” explained Rabbi Menachem Junik, rabbi of Beis Gavriel Lubavitch synagogue in Hendon, North West London. "Thank G-d, they were impressed by what we have established and agreed to extend their trip to speak to our members about Gavi and Rivki." On Tuesday night, Rabbi Holtzberg spoke to a crowd of men and women in the home of David Abramson, a founding-member of the Beis Gavriel synagogue. A number of those present had travelled in India and met Gavriel and Rivka in Mumbai along the way. "When people spoke about their own memories of Gavi and Rivki, I realised how close to home this terrible event was despite the geographical distance," remarked Adam Pomson, a member of Beis Gavriel synagogue. "Rabbi and Mrs Holtzberg's determination to turn an act of hate and destruction into something positive and empowering shows the strength and resilience not only of themselves but of the Jewish people as a whole." Rabbi and Mrs Holtzberg used the unexpected extension to their stay in London to spread their message to as many people as possible. Rabbi Holtzberg met with local communal leaders, including Dayan Chanoch Ehrentreu who served for many years as head of the United Synagogue Beth Din. He also spoke to young professionals at a lunch-and-learn in the global accountancy firm Deloitte and to students at a number of schools in London, including Hasmonean Boys’ School and Beis Yaakov Girls’ School. "The terrorists tried to take something away from us, and though it was an unspeakable tragedy, they did not succeed," he told students and teachers. "Our faith and our spirit cannot be destroyed. That is our message."